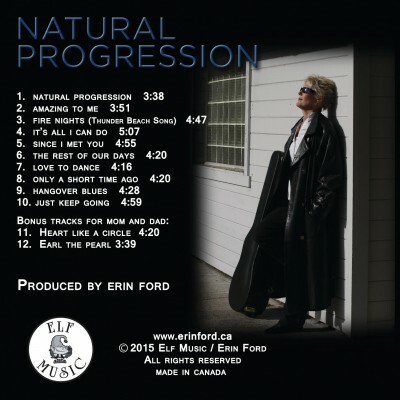 Toronto Indie Artist Erin Ford set out to record her original songs and create an album that was real, human, inspirational, positive and rhythmic; something reminiscent of her favourite era of music, the 70’s yet relevant for today. She accomplished this and more with her debut release, Natural Progression. A diverse collection of 12 songs with elements of light rock, R&B, pop, blues, jazz, reggae and some say a little country. It features Erin’s powerful vocals backed by lush layers of instrumentation. She calls it inspirational pop/rock with a vintage vibe. Mike Skinner, Toronto saxophonist and composer wrote, “Imagine if Janis Joplin had sung with Chicago and you have Erin Ford’s Natural Progression”. It took 8 years to complete with Erin facing 2 severe illnesses halting recording and editing twice. She had a creative hand in every aspect of the album right up to its fall 2015 release through her own indie label, ELF Music. Music Blogger Makeda Taylor gave this quote, “A dynamically appealing album with killer rocky blues vocals”. 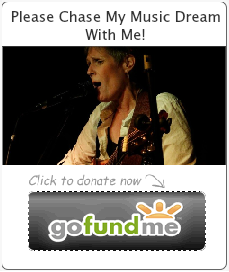 Erin’s performed on the Toronto scene since the early 90’s. She’s a FACTOR award recipient and through it an earlier release of her song, “It’s All I Can Do” was heard on Canadian radio throughout the 90’s. Jamie Vernon wrote in his Review on Rising Independents, “Though adept at guitar, Ford’s voice is her strongest point. It is obvious Erin has an ear for melodic pedigree and vocal strength to feed any song”. Her mission is to encourage others to never give up on their dreams and spread positivity, peace, love and unity through music. 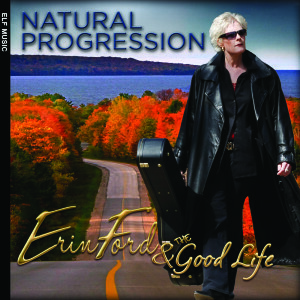 Imagine if Janis Joplin had sung with Chicago and you have Erin Ford’s Natural Progression. ~ MIKE SKINNER, TORONTO SAXOPHONIST, ARRANGER AND COMPOSER. A Dynamically appealing album with killer rocky blues vocals.